Brendan Stead joined the Elders Port Macquarie team in September 2017 as a partner in Sales. 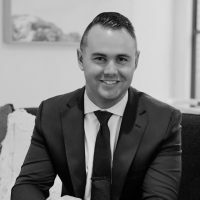 This new generation of real estate agent has made a big impact to real estate in Port Macquarie, often referred to as the young gun of real estate, the one man that demands perfection of his career and he enthusiastically delivers day in day out! As Brendan, always says ‘I just love real estate, it’s not just a job for me, it’s my lifestyle and my passion’. This attitude sets him apart, his energy and his thriving hunger to succeed is second to none. Brendan lives and breathes real estate, considering himself as more of a people person than anything else, and he understands the importance of what we do on a daily basis helping people and in most cases a real estate transaction is a major milestone in anyone’s life. Whether it be a family looking to upsize or downsize their home, or maybe an investor looking to increase their real estate portfolio. Brendan is very active in the local community and loves to connect with all walks of life and help them in any way he possibly can. Born and raised in country NSW, Brendan at a young age learned VERY quickly that his only chance of success was to work and work hard as soon as he could. With several record sales to his credit, Brendan continues to raise the benchmark in his pursuit for outstanding results. Having one multiple awards already for his incredible achievements, his dedication to achieving the best results for his clients not only continually exceeds expectations, but often surpasses street sales records in the area’s he operates. Brendan is passionate about Port Macquarie. With the climate, beaches and facilities that it has to offer, Brendan feels it places second to none. He truly believes that we have the best location, in the luckiest country in the world. Should you choose to work with Brendan Stead, you are not choosing just any agent – you are choosing the most passionate, hardest working agent in Port Macquarie! Meet some of Brendan’s happy clients. Would you like to speak to Brendan?